Since its start in 1989, Southwest Florida Veterinary Services has become the leading general and specialty veterinary hospital in Southwest Florida. 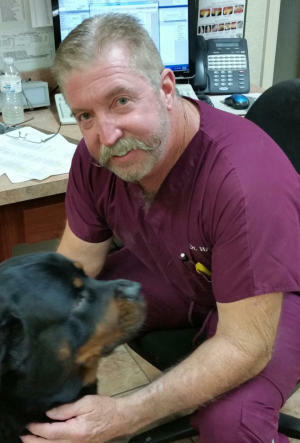 Committed to quality care, pet owners have come to rely and depend on Dr. Richard Hall and his team as a compassionate skilled partner in care of their most beloved companions. In order to provide your pet a superior level of veterinary care, we place great importance on using the latest state-of-the-art technology and diagnostic tools. Part of our commitment to raising the bar on the standard of care is that we are also diligent about promoting client education and responsible pet ownership. We recognize that providing the highest quality veterinary care includes keeping you, our clients, at the center of all we do. Southwest Florida Veterinary Services offers routine and wellness pet examinations, pet vaccinations, routine and specialized animal surgery, veterinary dentistry, equine medicine, and boarding. Our clinic is equipped with in house lab diagnostic, digital radiology and emergency care when needed. We also offer Laser Therapy and Ultrasound diagnostics for the complete care of your family members. Call today to schedule your appointment with Dr. Richard Hall, your companion’s health depends on it! Welcome to Southwest Florida Veterinary Services Lake Suzy, FL Call Us At (941) 876-5331 Southwest Florida Veterinary Services.